While hillbilly music may denote music of an older era and music, that doesn't mean that the technology of today cannot be used to enable others to learn about the people, the music and the history. We'll try to keep the postings small, short and to the point - news items, questions from fans and web site notes and updates as we go along. We found out through the grapevine that an Atlanta historian has undertaken an audio-visual project that documents historical Atlanta sites. One of our friends of the site and long-time country music journalist and author, Wayne W. Daniel was one such participant and offered some historical notes related to the Atlanta City Auditorium, which was the scene of the Georgia Old-Time Fiddlers Conventions that took place between 1913 and 1935. Good evening y'all, ole Gran'pa H. M. Crittick is pecking away at the keyboard again tonight. A few days ago, we had the occasion to hit the road on a business trip to southern California but found time to stop and visit with one of the early stars of country music, movies and television - Betsy Gay. We first learned of Betsy from an old Tex (Jenks) Carman song folio that had her picture on the cover. Later, Janet McBride helped us start to tell her story - Janet is one of the long time supporters of those who still find the lost art of yodeling a part of country music's history that needs to be preserved. Needless to say, Janet arranged for us to talk with Betsy one Saturday afternoon, then Betsy allowed ole Gran'pa to stop by for a visit. Our visit started from just about the moment we stepped in. She made us feel like were an old friend or relative. In just a few seconds we were sitting at her dining room table and she was showing us her scrapbook she had begun and a pile of many old photos from her career. This lady's career touched on just about everything and everyone. And yet she found the time to get married and raise five children. She was Alfalfa's girl friend in the old Our Gang / Little Rascal series. She was in the Tailspin Tommy's series. She sang with Freddie Martin's orchestra - having a hit with Mockin' Bird Hill. She appeared on many Los Angeles country music radio shows - including those run by Foreman Phillips. Cliffie Stone. Texas Jim Lewis. She was a part of the Squeakin' Deacon's show on tv as well for 26 weeks. She was in the cast of the Country America show that featured such legends as Freddie Hart, Jerry Wallace and Lefty Frizzell along with host, Joe Allison. She was a part of the legendary Town Hall Party show. It was hard to imagine she was over 80 years old, she was still as enthusiastic as can be, often singing several verses of songs that came to mind when she would turn through the photos. It was hard to keep up with her - it was like a staccato conversation of her memories as we turned through her photos. She was a part of Spade Cooley's early history in Los Angeles - working with his band at the legendary Venice Pier Ballroom that Foreman Phillips operated in that day. She played for us several of her old recordings from a CD that her family was trying to compile of her early vocal work. Her voice was crystal clear and strong back then. She is a petite person, perhaps similar to Brenda Lee in that regard, small, but with a great vocal projection. Spike Jones. Texas Jim Lewis. Merle Travis. Cliffie Stone. Eddie Cletro. Tex Williams. Richard Dix. Monte Hale. Redd Harper. Stuart Hamblen. Carl (Squeakin' Deacon) Moore. She worked with them all, but you would never know she had rubbed elbows with such legendary artists. Workin' with this feller on this web site does have its benefits sometimes. This is one time the benefits were something to treasure - being able to take a break and visit with someone who was a part of that golden era of country music, or rather, hillbilly music. And as the sun set in the west as we continued our drive down Rte. 99 to Los Angeles, we plopped in another CD of a recording of the Hollywood Barn Dance from that era. Somehow, that long drive didn't seem so long anymore. Is Gaylord Entertainment secretly funded by other musical genres to tear down what was country music chord by chord? The logic of their business decisions over time seem to defy common sense and lack of understanding of the core value of WSM and the Grand Ole Opry. This week, like a lot of other corporations, they thought the thing to do was throw a lot of folks under the bus to 'cut costs'. Did any executives lose their jobs or have a cut in pay? Or did they get a bigger bonus package because of their cuts? Their latest decision has made the front page of the Nashville Tennessean. They let Keith Bilbrey go - someone who had worked for their station for 34 years, an on air public good will ambassador for their Opry franchise and an announcer on the famed show. Has any other Opry announcer ever suffered such a fate? "The ride ended because of money. Gaylord Entertainment, which owns the station, has dissolved 350 positions. Bilbrey's midday shift had fewer listeners than the morning and afternoon drive times, so he got the boot." I would be willing to bet that they spent the least amount of promotional dollars and effort for his shift. In fact, shouldn't they be firing the marketing and sales staff instead for not being able to provide the sponsorship and ratings they seem to covet? That's where the problem is. Replacing him with some nameless person in a computer terminal won't solve anything. Did the executives give up their perks? Their cars? Their expense accounts? Did they eliminate the executive bonuses? Why doesn't Gaylord just give up the Opry and WSM franchise? It's clear they think everything can be run without any human involvement; they think profits are nothing more than a macro button they can automate. They blew the Opryland franchise and the family aspect tied to the Opry. Yeah, the world needed another shopping mall instead. Boycott their hotels when you go to Nashville. Send them a message. The micro managing have to have a quarterly profit because Wall Street says so mentality has got to go. If you're in the entertainment business - you provide entertainment. You don't get rid of it. Was it worth the front page publicity and bad public will it generated for that 'decision'? It's about PEOPLE Gaylord - will you ever learn the lesson? Ole Gran'pa H. M. Crittick was on the roamin' about again a while back. Drivin' up the old super highway, we found one of those "Friends of the Library" type of store that has a whole bunch of old used books, sheet music and records. All at your every day down to earth prices without the fancy shipping prices a lot of eBay sellers like to rip you off for. We found some old sheet music. Then we started browsing their album sections. One got our attention - it was a six LP set by the Longines Symphonette Society featuring Tennessee Ernie Ford doing Inspirational Songs. And well, when we found out the price was less than a happy meal, we made sure it went home with us. It was a 6-LP set of 60 songs. We went ahead and converted that to digital format so we can put together a CD or two to listen to it in the car and elsewhere, know what I mean? Ole Gran'pa has vague memories of seeing the ole Pea Picker himself on the tv box at one time. He had a voice and personality that just got your attention. When we made the CD, we picked many of the tunes we're familiar with. What struck ole Gran'pa was perhaps where today's artists got their inspirations to do their Gospel albums. We admit we are a fan of Charley Pride - our evidence is having every LP and CD. Charley did a Gospel album in the early 1970s and included such songs as "Did You Think To Pray", "Whispering Hope" and "Church In the Wildwood". When we hear Ernie do these Gospel tunes, it led me to start comparing the way he did them to Charley's versions. The similarity is apparent to me. In the booklet with the 6 LP set, it cites what Ernie's approach was to these tunes. "When he performed gospel songs on his weekly television show he shunned the ultra-sophisticated, flamboyahntly produced "numbers." "You go dressing up a simple message from the Bible, and you miss the point. The point is not how fancy you can make it. That's just showing off." Listening to the CD I made, it makes you feel as if you are listening to Tennessee Ernie doing a concert in a church. The arrangements are sparce - a church organ, and not much else, the male and female church choirs, at times almost accapella in sound. His voice is crystal clear and you feel the spirit and reverence he puts into the tunes and melodies. Make no mistake about it - this guy knew how to use his voice. Now to listen to that live album from the Indiana State Fair in the early 1960s. And we do remember stopping in to have a meal at his restaurant way back when when Mom drove us down to Nashville one summer weekend to see the Opry. We still have that EP. PBS a while back broadcast a show featuring the Gospel tunes he always did at the end of his shows. If you get a chance - don't miss the rerun. We made sure we recorded that one. Ole Gran'pa H. M. Crittick is atcha again. We've been meaning to write this for a long spell and well, the itch needed scratching again when we pulled the CD out again. A while back, the ole boy had to take a long trip down Rte. 99 in Central California, the heart of California's farm country. Naturally Ole Gran'pa pulled a few CDs from his library to listen to on the way, some new ones submitted for review, some old favorites as well. I started with one from Ben Stafford Rodgers called "Texas Then & Now" partly because I wanted to hear the older, familiar tunes he had on that CD. Now sometimes folks tackle those old classics and well, its a tough comparison when you think of the first time you heard them. I could make this review very short - the truth is - I listened to the CD over and over on the 3 hour ride. He does all of them justice. The music backing him on these vocals is a nice feel to that old style of country music that many still enjoy - the fiddles, steel guitar, electric guitars. His voice is crystal clear and easy to listen to - you can follow the story in the lyrics of the tunes he sings. Try listening to the radio these days and tell me that's possible - they probably think they're in a hollow arena and having to belt it out in the studio figuring no one going to hear them anyhow. The first tune was Marty Robbins' classic El Paso - that's what started getting my attention. Then he goes to his version of Cool Water, the tune made famous by the Sons of the Pioneers. I started clicking through to the other tunes wanting to get a quick sample to make sure I wasn't being setup for a kick back into reality if the others didn't follow that pattern. But from Back in the Saddle Again (surely you remember ole Gene? ), Cattle Call (hard for me to figure which fellow did it better - Eddy or Slim, but I still enjoy those ole 78s), Shame on You, New San Antonio Rose, Bouquet of Roses and a nicely done Jim Reeves classic, Adios Amigo. 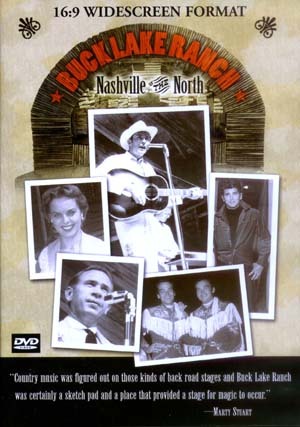 Fans of the older era of country music will be familiar with all the tunes on this CD. You may find it hard to take this one out of the CD player when your driving around. I just put it in after that quick run through and then let it start doing its random selection. I did not get tired of listening to it and found myself trying to warble along (well, since I was the only one in the car, I could get away with that). And before I knew it, my trip was over. To Mr. Rodgers, sorry I didn't put the word out earlier. To the rest of y'all - you can't have my copy. Visit Ben's site at Ben Stafford Rodgers. Ole Gran'pa H. M. Crittick been taking too long to get back on the old computer contraption. But after kickin' back last night and watching a documentary called "Buck Lake Ranch - The Nashville North", ole Gran'pa just gotta give you an earful. You won't find musical performances on this video, but I guarantee you, once you put it in, you'll kick back and wonder at the images, memories that it provides about a long ago venue that was very popular in Northern Indiana, Buck Lake Ranch. The video is nicely done. We get to hear from many country legends - Little Jimmy Dickens, Bill Anderson, Loretta Lynn, Ray Price, Connie Smith along with Indiana's own legendary Joe Taylor of the Indiana Redbirds and Patsy Corbett. You won't hear a long continuous dialog by any of the artists - but you will get a nicely organized arrangement of their memories in a way that tells the story of what Buck Lake Ranch was all about and why it was so popular. You'll get to know who the owners were, Harry and Eleanor Smythe who created this little corner of country music history on about 80 acres on a 'rolling farm and timberland a few miles outside Angola, Indiana. I know my aunt and uncle visited the venue - I've found pictures of their visits in their photos we inherited. And for the life of me, I have vague memories of maybe being there once when I was knee high to the weeds or maybe I have it confused with something else back in Indiana. You get to see some snippets of performances without the audio to give you a feel for the stage shows. You also get a generous dose of the various introductions of the acts on the shows as well. The artists tell you why they liked playing Buck Lake Ranch - the way it was setup. The way they had to move their instruments to the "Wigwam" when the weather got bad and they moved the music indoors. Each chapter gives you a different insight of what Buck Lake Ranch was about. It just seemed to flow naturally. The key to it all was making it a family experience. The Smythes catered to the children a lot knowing that if they got the parents there, they would bring the whole family and would of course spend a little money. You may wonder about the mention of pickle juice. Should I spoil it for you? The Smythes were kind to let the folks bring their own food in even though they did offer several concession stands with the usual southern, family style cooking. But where they drew the line was in letting people bring drinks in - they did not allow that as well, that's where they had to make a little money. And maybe you'll understand this pickle thing now. There are many, many pictures of Buck Lake Ranch and what it was all about - from the onstage performances, to the western village type setup on the grounds, the concert settings, the timberwood type stage it had. The artists tell you the acoustics were very good for that type of venue. One of the artists played at Buck Lake Ranch 27 times (I can't read my own writing to tell you who that was)! Loretta Lynn told of wanting to play it again after she recalled she hadn't been there in a while. It was a part of country music Americana - those outdoor parks that featured country music on a Sunday afternoon. It allowed families an easy way to get out and enjoy the outdoors as well as an afternoon of entertainment. Buck Lake Ranch opened for business back in 1947 and according to the video has only had three owners. The Smythes, like John Lair who created Renfro Valley, created a very unique setting that lasted for generations, entertaining families - a unique experience that seems to be a part of what country music's heritage is all about. One of the other things we learned watching the video was the way the Smythes ran the operation. They were sticklers for punctuality and keeping things on time. The artists mention how they would make sure they didn't over-extend their shows to make sure it stayed on course. Standing in the wings offstage giving them signs - they had their ways of prodding the artists along. All of the artists had fond memories of their dealings with the Smythes. Ole Gran'pa enjoyed this video put out by Newshound Productions (www.newshoundproductions.com) - my advice is to pop that bowl of popcorn, get your favorite beverage and sit back and enjoy your memories of Buck Lake Ranch or maybe, discovering it for the first time. Buck Lake Ranch. Renfro Valley. Country music. Know what I mean? Over the course of his 30-song sing-along at Radio City Music Hall last night, Willie Nelson proved he's nothing if not generous. When the man says he's about to play a Hank Williams tune, he's actually about to play three Hank Williams tunes. And don't try to clap, or whoop, or yell "WILLLLLLLIE!" when he's done crooning "On the Road Again" because you'll miss the opening couplets of "Always on My Mind." Nelson dashed from song to song to song, braids hanging to his belly, pausing only occasionally to fling red bandannas into the crowd. It took a fortuitous find and years of legal wrangling, but some of the lesser-known recordings by country great Hank Williams will soon be available for mass consumption. "The Unreleased Recordings" includes performances from the "Mother's Best Flour" radio program, which Williams hosted on the legendary WSM-AM Nashville in 1951, two years before his death. Time Life will release the 143 recordings in various packages in the next three years through an exclusive agreement with the Williams estate. The first set is due October 28. Williams and his band prerecorded 72 shows to run while they were on tour. The shows were recorded on 16-inch acetate discs that were later thrown into the trash during a station move in the '60s but salvaged by WSM employee Les Leverett. Williams said that even devotees of her father's music will find something new here. "Unless you were listening that morning in 1951, you've never heard that version of 'Cold, Cold Heart,'" she said. "You may have heard the master, but you've never heard the February 3, 1951, version of Hank Williams singing it. "The fidelity of these recordings (is) better than his MGM masters," she said. "These have not been enhanced or tinkered with. It's as if it was 1951 and my dad was recording it right then. It was a one-time take." In addition to Williams' best-known material, the recordings include 40 songs he was never known to have performed and others he never recorded commercially, including "Blue Eyes Crying in the Rain," "Cherokee Boogie" and "On Top of Old Smoky." When the Refugio Country Opry was started seven years ago, the organizers wanted it to be about more than music. More than $32,600 given out in scholarships later, board member Jay Monrad believes it is. “We do this mainly for the kids in the community. It’s a way to listen to great music but at the same time, support our local students as much as we can,” he said. The opry, a nonprofit organization, puts on a show the first Thursday of every month, showcasing both local and out-of-town talent in genres such as country, gospel, rhythm and blues and comedy. At the end of the school, the opry takes the money they received from their $5-per-person admission price and searches for deserving students from the high schools in Refugio, Woodsboro and Tivoli. Monrad added that depending on how much money they made over the year will determine how much they give out in scholarships. For example, last year, they gave out 18 $500 scholarships. “Every penny above our expenses all goes toward the scholarships,” he said. State and local officials honored a music icon in a big way, Monday afternoon. Friends and family gathered in Lincolnton to dedicate a highway to James Roy "Pop" Lewis. It’s a music legacy that started more than 50 years ago. "He stole Mamma from a second story window in 1925. They eloped. They had all of us. We bought a bus and started singing," said “Little” Roy Lewis, Son. Little Roy Lewis is the youngest son of James Roy "Pop" Lewis. He remembers the musical foundation his father laid down to create the First Family of Bluegrass Gospel music. It all unfolded in Lincolnton. "I remember getting into a Model “A” Ford and going to our piano lessons. My grandmother was in the other room listening to opera. We would hear the guitar and fiddle and knew we wanted to do something other than play the piano,” said Lewis. But this bluegrass gospel group wasn't always a Christian band. "We use to play hillbilly music back in the '40s. But we got booked on a Christian Radio station. My mamma said you can't sing what you've been singing. So that day we started to sing religious songs,” said Lewis. After that switch, the rest was bluegrass gospel history. To this day, the Lewis family carries on Pop's legacy. His hometown of Lincolnton is paying tribute to the man who never forgot his roots. Just take a drive along State Route 378 in Lincoln County; you'll see a sign dedicated to remember this music legend.